The Wyndham New Yorker Hotel is a historic hotel located at 481 Eighth Avenue in New York City, United States. The 43-story Art Deco hotel, opened 1930, is a 1,083-room, mid-priced hotel. It is located in Manhattan's Garment District and Hell's Kitchen neighborhoods, near Pennsylvania Station, Madison Square Garden, and Times Square. The 1-million-square-foot (93,000-square-metre) building offers two restaurants and approximately 33,000 square feet (3,100 m2) of conference space. Since re-opening as a hotel in 1994, it has undergone approximately $100 million in capital improvements, including lobby and room renovations and infrastructure modernization. The Unification Church purchased the building in 1975, and since 2014, it has been part of the Wyndham Hotels & Resorts chain. Due to its noticeable marquee and proximity to the Empire State Building, it makes appearances in many films and is the backdrop for TV-studio reports and interviews broadcast worldwide from New York by BBC News. The New Yorker Hotel was built by Garment Center developer Mack Kanner. When the project was announced in 1928, the Sugarman and Berger designed building was planned to be 38 stories, at an estimated cost of $8 million. However, when it was completed in 1929, the building had grown to 43 stories, at a final cost of $22.5 million and contained 2,500 rooms, making it the city's largest for many years. Hotel management pioneer Ralph Hitz was selected as its first manager, eventually becoming president of the National Hotel Management Company. An early ad for the building boasted that the hotel's "bell boys were 'as snappy-looking as West Pointers'" and "that it had a radio in every room with a choice of four stations". It was a New Yorker bellboy, Johnny Roventini, who served as tobacco company Philip Morris' pitchman for twenty years, making famous their "Call for Philip Morris" advertising campaign. The hotel opened on January 2, 1930. Much like its contemporaries, the Empire State Building (1931) and the Chrysler Building (1930), the New Yorker was designed in the Art Deco style which was popular in the 1920s and 1930s. In his book New York 1930 Robert A. M. Stern said the "New Yorker's virtually unornamented facades consisted of alternating vertical bands of warm gray brick and windows, yielding an impression of boldly modeled masses. This was furthered by the deep-cut light courts, which produced a powerful play of light and shade that was enhanced by dramatic lighting at night". In addition to the ballrooms there were ten private dining "salons" and five restaurants employing 35 master cooks. The barber shop was one of the largest in the world with 42 chairs and 20 manicurists. There were 95 switchboard operators and 150 laundry staff washing as many as 350,000 pieces daily. In his final years, the inventor Nikola Tesla lived in the hotel's room 3327 and died there penniless on January 7, 1943. Throughout the 1940s and 1950s, the hotel was among New York's most fashionable. The New York Observer noted that in the building's heyday, "actors, celebrities, athletes, politicians, mobsters, the shady and the luminous—the entire Brooklyn Dodgers roster during the glory seasons—would stalk the bars and ballrooms, or romp upstairs"; It hosted many popular Big Bands, such as Benny Goodman and Tommy Dorsey, while notable figures such as Spencer Tracy, Joan Crawford and Fidel Castro stayed there. Inventor Nikola Tesla spent the last ten years of his life in near-seclusion in Suite 3327, where he died, largely devoting his time to feeding pigeons while occasionally meeting dignitaries. In later years, Muhammad Ali would recuperate there after his March 1971 fight against Joe Frazier at the Garden. Notwithstanding its early success, New York's changing economy and demographics caused the building to slowly decline and, as a result, its ownership changed several times. It was purchased by Hilton Hotels in 1953 for $12.5 million and following an antitrust suit by the federal government, was sold just three years later, in 1956, for $20 million to Massaglia Hotels. In 1959, Massaglia sold the hotel to an investment syndicate known as New York Towers Ltd., which went bankrupt, allowing Hilton to reacquire the building in 1967. By the time Hilton reacquired the hotel, the pronounced decline in New York's fortunes, coupled with the construction of new, more modern hotels, caused the New Yorker to become unprofitable. As a result, Hilton closed the hotel in April 1972. Initially left vacant, several proposals were made for the building, including redevelopment as a low-income housing development, and a hospital. Ultimately, in 1975, it was purchased by the Unification Church of the United States for $5.6 million. The church converted much of the building for use by its members. When it was built, the New Yorker Hotel had coal-fired steam boilers and generators sufficient to produce more than 2,200 kilowatts of direct current electric power. At the time, this was the largest private power plant in the United States. The hotel's own direct current generators were still in use during the Northeast Blackout of 1965, but by the late 1960s the hotel's power system had been modernized to alternating current. In a dedication ceremony held on September 25, 2008, The Institute of Electrical and Electronics Engineers (IEEE) named the New Yorker Hotel's direct current power plant a Milestone in Electrical Engineering. A bronze plaque commemorating the achievement was presented to the hotel by IEEE. In 1994, the Unification Church elected to convert a portion of the building to use as a hotel again and the New Yorker Hotel Management Company took over operation of the building. It began the largest renovation project in the New Yorker's nearly 65-year history, completed in 1999, with $20 million in capital improvements. The hotel joined the Ramada chain in 2000. 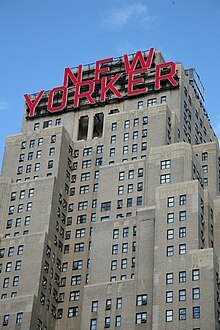 In 2005, the hotel's management began the process of replacing the New Yorker's famous sign, which hadn't been lit since 1967 and was in badly need of repair. The sign was completely replaced by an energy efficient LED sign that was installed in time to celebrate the hotel's 75th Anniversary. A 75th Anniversary celebratory event was held at the hotel on December 8, 2005, where the new sign was officially switched on for the first time by Dr.Charles Yang, President of the New Yorker Hotel Management Company, Kevin H. Smith, the hotel's General Manager, Alan Ostroff, of the Cornell University School of Hotel Management, Jean Cummins, singer with the hotel's house band in the 1930s and Patricia Hitz-Bradshaw, granddaughter of Ralph Hitz, the hotel's first General Manager. In August 2007, the hotel began a second capital improvement program, which was completed in February 2009 at a final cost of $70 million. These improvements increased the number of guest rooms available from 178 in 1994 to 912, located on floors 19 through 40. The renovation project was designed by Stonehill & Taylor Architects. Interior improvements included room restructuring and augmentation (now called "Metro" and "City View" rooms). Other improvements included a refurbished front entrance, lobby redesign, foyer reconstruction, and ballroom renovations. The hotel also expanded its Wi-Fi and PDA support, and added high-definition flat-screen televisions in all rooms. In addition, individual room air-conditioning units were replaced with modern centralized heating and cooling systems throughout the entire hotel. In 2009, conference room space was added to the hotel through the conversion of a defunct Manufacturer's Hanover Bank branch in the hotel, bringing the total meeting space to just over 33,000 square feet (3,100 m2), in two ballrooms and twelve conference rooms. The New Yorker Hotel joined the Wyndham Hotels chain in March 2014. Wyndham has undertaken additional upgrades to the hotel, including lobby and restaurant renovations, to attract more business travelers in anticipation of the massive Hudson Yards Redevelopment Project to the west. ^ a b c "Caught Between the Moonies and New York City: The New Yorker Hotel's Office Idea". 24 June 2011. Retrieved 30 October 2016. ^ Sexton, R.W. (1929). American Apartment Houses, Hotels, and Apartment Hotels of Today. New York, New York: Architectural Book Publishing Company, Inc. pp. 184–185. ^ "Plans for the New Yorker, 38-Story 8th Av. Hotel, Filed". 3 March 1928. Retrieved 30 October 2016 – via NYTimes.com. ^ "GREATER ACTIVITY FOR 34TH STREET; Westerly Blocks Destined to Be an Important Office Building Centre. AMPLE TRANSIT FACILITIES Mack Kanner, Builder of Hotel New Yorker, Predicts Commercial Growth". 1 September 1929. Retrieved 30 October 2016 – via NYTimes.com. ^ "Joseph F. Cullman 3rd, Who Made Philip Morris a Tobacco Power, Dies at 92". The New York Times. 1 May 2004. Retrieved 30 October 2016. ^ a b c d e Velsey, Kim (20 November 2014). "Long Famous But Not Quite Fabulous: The New Yorker Hotel". New York Observer. Retrieved 3 December 2014. ^ a b c Bamberger, Werner (20 April 1972). "New Yorker Hotel, Sold to Become a Hospital, Closes Doors After 42 Years". Retrieved 30 October 2016 – via NYTimes.com. ^ Times, Special To The New York (26 November 1953). "Hilton Chain Acquiring New Yorker Hotel Here". Retrieved 30 October 2016 – via NYTimes.com. ^ Times, Special To The New York (15 May 1956). "New Yorker Hotel Is Sold by Hilton Group To Massaglia, Owner of chain of 11 Units". Retrieved 30 October 2016 – via NYTimes.com. ^ Fried, Joseph P. (9 December 1967). "New Yorker Hotel Repurchased by Hilton Chain; Purchase Subject to Debts". Retrieved 30 October 2016 – via NYTimes.com. ^ "Commercial Real Estate; Making New Yorker Hotel New Again". The New York Times. 6 January 1999. Retrieved 30 October 2016. ^ "New Yorker Hotel embarks on $65 million renovation". Press release. ^ a b Johnson, Richard L. "The 912 room New Yorker Hotel Completes Massive 18-month, $70 million Renovation / February 2009". Retrieved 30 October 2016. ^ Hotel News Resource (2014-03-03). "Iconic New Yorker Hotel Joins Wyndham Brand". Hotelnewsresource.com. Retrieved 2016-03-05. Wikimedia Commons has media related to Wyndham New Yorker Hotel.